Governor Ben Ayade of Cross River State has met with bigwigs of the ruling All Progressives Congress (APC) over the weekend. The meeting, which started during the thanksgiving ceremony organised by the Minister of Niger Delta Affairs, Usani Uguru Usani, in Calabar, was believed to have focused on the governor’s political future. 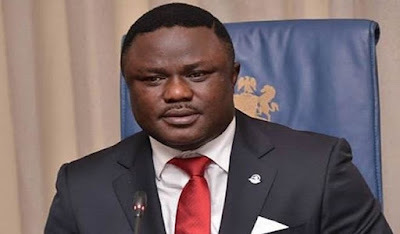 A former senate leader, Victor Ndoma-Egba, a former minister of defence and presidential aspirant, Rabiu Musa Kwankwaso, governors Rochas Okorocha of Imo State and Godwin Obaseki of Edo State, who graced the occasion, were said to have convinced Ayade to leave the PDP for the APC. Later, Ayade drove with them and other top military brass that also graced the event in large numbers to an undisclosed location where Okorocha and other APC leaders were said to have got his firm commitment. Speculations have been rife over Ayade’s secret ambition to cross over to the APC, having hobnobbed with key national leaders of the party few months after he was sworn in. He has also been showering encomiums on President Muhammadu Buhari whom he had criticised before his victory in the last presidential election. But in a swift reaction, Ayade’s media aide dismissed the insinuation that the governor was planning to move from the PDP. Christian Ita, chief press secretary to Ayade, said the governor was just playing the role of a good host to the array of political, military and business leaders that thronged Calabar to honour a prominent son of the state. “It is not true that the discussion our governor had with the APC leaders had anything to do with leaving the PDP for the APC,” said Ita. Okorocha, who had visited the state and met Ayade previously over same issue, had commended the governor for having the blessing of God with the appointment of his “sons” into key national positions. Remarking, Usani commended those who honoured his invitation and described them as his close friends. He stated that hatred for one another was the key reason for underdevelopment of Cross River State.